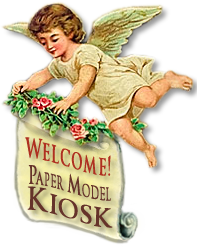 The Manger Scene Sheet has five quality-printed pages. 1930's punch-out The Manger Scene features the artwork of Corinne Bill Bailey. 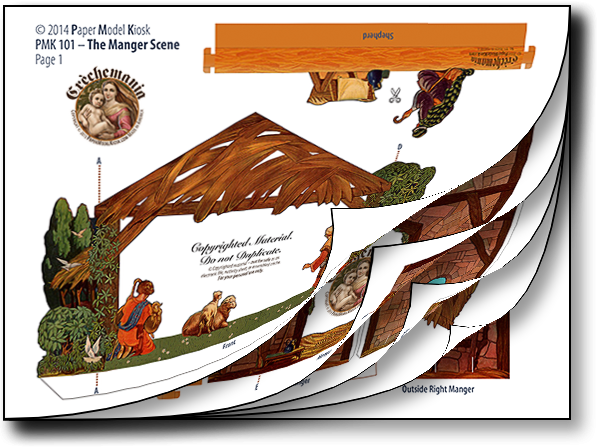 The Manger Scene folds flat, for easy storage. A manger scene "To set up"
There's so much about the 1930's The Manger Scene to enthrall the crèche enthusiast. There'sCorinne Bill Bailey'sfine artwork, those rich, saturated colors. There are twelve colorful figures: adoring angels and shepherds, and Magi in splendid raiment astride their even more splendidly adorned camels. The Manger Scene (see image at left. )was originally issued by the Saalfield Publishing Company, Akron, Ohio, as a 10 page punch out "To Set Up." As a table-top nativity scene, that is,arranged at will, with the base of the punched-out pieces folding back to create a stand depicting grass or straw. It took a while for me to figure out how I wanted this paper nativity presented, and I've decided on the old stand-by: a fold-out with six layers that folds flat (see image at left) for easy storage. But even with all those layers I couldn't accommodate those splendid Magi. Maybe there's another iteration of The Manger Scene yet to come? I hope you'll enjoy this new, Crèchemania edition, of The Manger Scene. A Premium Download and quality Printed Sheet to cut out and assemble a fold-out nativity of six layers inspired by a 1930s vintage punch-out edition from the Crèchemania Collection. Size: 8.75 x 8 x 3 inches. The 1930's vintage punch-out that inspired this nativity may be found listed for $79.99.